Quantum information has been transmitted for the first time at a relatively high rate down a long-distance optical fibre that is busy with other telecommunications traffic – something that would normally disrupt quantum communications. The system was developed by researchers at Toshiba's Cambridge Research Laboratory in the UK together with engineers at Cambridge University. 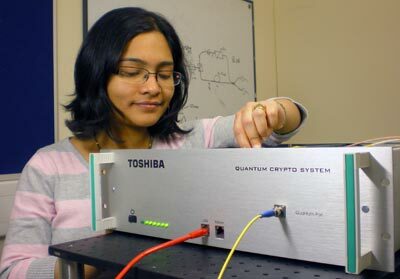 It relies on a detector that can be switched on for about 100 ps (10–10 s) to ensure that it detects a quantum signal efficiently and rejects most of the background noise. While most quantum-information applications are decades away, some organizations including several banks in Switzerland are already using the technique of "quantum cryptography" to ensure the secrecy of their communications. Quantum key distribution (QKD) allows two parties (by convention called Alice and Bob) to exchange an encryption key, secure in the knowledge that the key – which codes and decodes the data – has not been read by an eavesdropper (called Eve). This guarantee is possible because the key is transmitted in terms of quantum bits (qubits) of information. If intercepted and read by a third party, such qubits are changed irrevocably, which signals to Alice and Bob that Eve has seen the key and so not to use it. Commercial QKD systems use photons as qubits because the particles can travel long distances in optical fibres without losing their quantum nature. The difficulty, however, is picking out a qubit photon from the noisy background of random photons that are created when much more intense data signals are sent through a commercial telecommunications fibre. One solution that has been adopted is to use "dark fibre", which does not carry any telecommunications data signal. Unfortunately, leasing or laying dark fibre is very expensive. What the Toshiba and Cambridge researchers have done is to find a way of filtering out the noise and focussing on the qubit photons. Developed by Zhiliang Yuan and Andrew Shields at Toshiba along with colleagues at Cambridge, the scheme involves Alice creating a qubit photon within a 30 ps time window. The photon is then sent down a 90 km fibre to Bob, who detects the photon by switching on his detector for just 100 ps at the expected arrival time. Although the fibre is full of noisy photons, most of the randomly arriving noise photons will not reach the detector over this extremely short duration, explains Yuan. As for Bob, he knows exactly when to look for Alice's photon thanks to a timing system that runs over the same fibre. Based on an off-the-shelf diode laser, the clock signals are sent from Alice to Bob and allow Bob to determine the arrival of the qubit photons to within 10 ps. The team tested its system on long sections of standard fibres, transmitting standard telecoms data at a rate of 1 Gbit/s in both directions along the fibre, which creates background noise. Despite the noise, the team was able to transmit quantum keys at a rate of 500 kbit/s over a 50 km section of fibre – which is 50,000 times the previous fastest data rate for this distance. The team was also able to send quantum keys at nearly 8 kbit/s over a 90 km fibre – the longest distance yet for an active telecoms fibre. Although these distances are not good enough to allow quantum communications across oceans or continents, 90 km is more than enough for a metro network in a large city. Yuan told physicsworld.com that the Cambridge researchers are now working with colleagues in Japan to perform stringent field tests to improve the performance of the system. As well as QKD, the temporal filtering technology could also find use in other quantum-information applications, where weak quantum signals have to coexists with intense data signals in the same transmission media. One example is distributed quantum-information processing and computing. The work is described in Physical Review X.